The SeismaFlex™ Twist bracket is designed with a “U” bend that springs and flexes to absorb displaced seismic energy, reducing stress at the fastening connection. The shape of the bracket allows the braced item to sit away from the wall to accommodate wall molding, electrical plugs, etc. Unlike a rigid “L” bracket that immediately transfers force to the connecting hardware, often snapping the heads off screws or prying them out, the SeismaFlex™ bracket can handle stress from any direction and has a better designed hole pattern which allows the bracket to fasten to a wall stud with a single large lag. 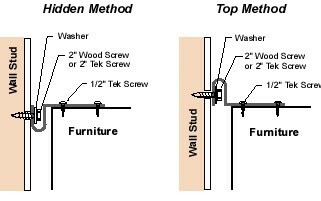 The furniture side attaches with multiple screws or adhesive. SeismaFlex™ Twist brackets feature an improved design that handles stress from any direction better than the original SeismaFlex™ while still allowing the bracket to be attached to a wall stud with a simple lag screw.